Oftentimes the ideal vision for a project can be a hybrid of technologies. This public art project in Milwaukee led by artist Janet Zweig, entitled “Pedestrian Drama”, is a good example. The project is comprised of 5 kiosks mounted on 5 lamp poles each showing 3 interconnected photographic animations or “dramas”, printed on successive “flaps”. The flaps turn and display the dramas like a flip book, much the way train signs displayed destinations and alarm clocks displayed the time years ago. Each flap unit has 60 images; there are 900 still photographs in all. 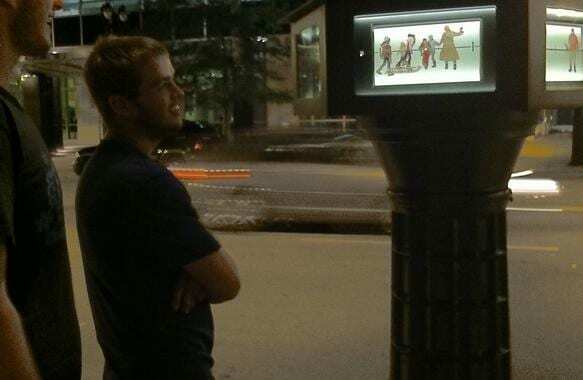 They are housed in custom-designed aluminum cases and triggered by motion detectors when pedestrians pass by. We provided the engineering, fabrication and installation of the kiosks. Enhanced Automation in Menomonee Falls, WI performed all of the electronic work, sensors and thermostat. Built into each kiosk is a high and low temperature sensor. If the temperature inside the kiosk exceeds the specified range, it will automatically shut down to prolong the lifespan of the internal components. There is also a heater and a thermostat to eliminate condensation. The majority of electronic parts were Allen Bradley branded and programmed with Rockwell Automation software.